The plants can be harvested at any stage, but are best in the fall when the leaves are sticky and aromatic (Hedges, K. & C. Beresford Santa Ysabel ethnobotany, San Diego Museum of Man Ethnic Technology Notes No. @0. San Diego, California.1986 p. 58). The leaves, stems and flowers are used (Heizer, R.F. & A.B. Elsasser The natural world of the California Indians. University of California Press, Berkeley & Los Angeles, California. 1980 p. 271). They are either eaten or made into tea, decoration, or poultice. The flowers and the bitter, aromatic leaves may be used fresh or dried. Infusions of Yerba Santa leaves and flowers were used to treat fevers, coughs, colds, stomachaches, asthma, rheumatism pleurisy, and to purify the blood. Leaves were smoked or chewed to relieve asthma, coughs, colds, headaches, and stomachaches. Heated leaves were placed on the forehead to relieve headaches (Bocek, B.R. Ethnobotany of Costanoan Indians, California, based on collections by John P. Harrington. Economic Botany, Vol. 38, No.2 1984 pp. 240-255) and other aches and sores (Barrett, S.A. & E.W. Gifford Miwok material culture: Indian life of the Yosemite region. Bulletin of Milwaukee Public Museum Vol. 2, No. 4. Yosemite Association, Yosemite National Park, California. 1933 p. 388). The sticky leaves stay in place upon the skin. Mashed leaves were applied externally to sores, cuts, wounds, and aching muscles. Mashed leaves were also used to reduce the swelling and relieve pain caused by bone fractures (Barrett & Gifford 1933). 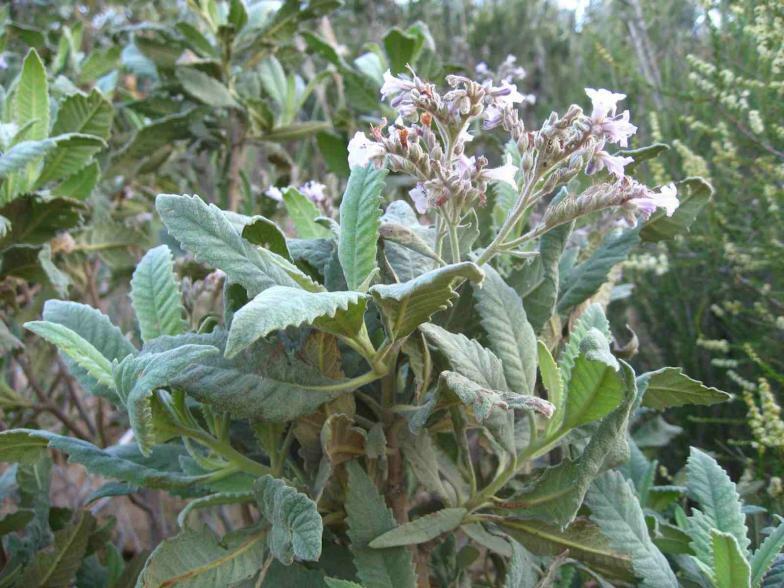 Yerba Santa, used alone or combined with other herbs, was applied to infected sores on humans and animals. The branches and leaves were burned in steam baths to treat rheumatism. 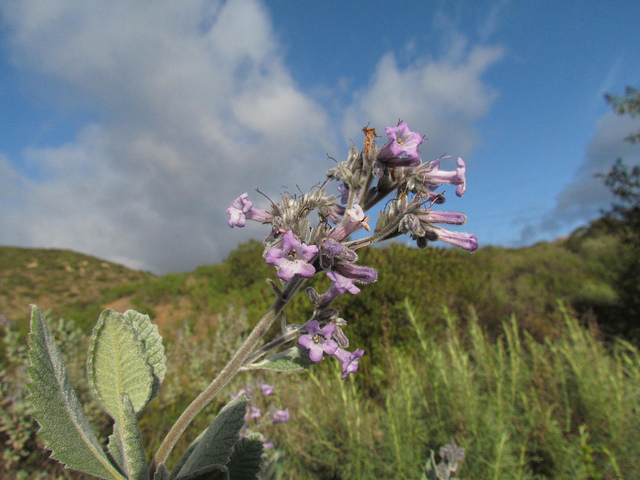 Yerba Santa (Eriodictyon crassifolium) was called wishap’ by the Barbareno, Ineseno, and Ventureno Chumash. Eriodichtyon means “wooly net”, and crassifolium means “thick-leaved”. 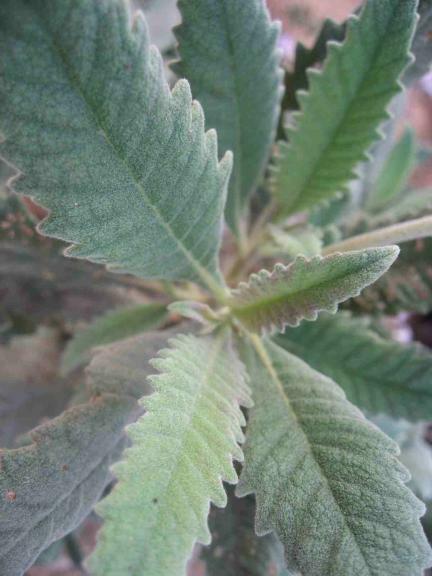 Seedlings and young plants are relatively nutritious and palatable but the bitter compounds in mature Yerba Santa shrubs discourage most large herbivores. General- Waterleaf family (Hydrophyllaceae). Yerba Santa is a perennial evergreen shrub native to California and Oregon. The stems are black with shredding outer bark. The lance shaped leaves (4 to 15cm long)are thick and leathery with a glutinous, shiny, upper surface. The leaves are dark green above with lighter green beneath and can have either smooth or saw-toothed edges. The white to purple trumpet-shaped flowers (8 to 17mm) grow in branched panicles at the stem ends. The flowers bloom from May to June or July. The small capsulate fruits (2-3mm) rpien in September and contain from 2 to 20 small black seeds. Yerba Santa grows below 1600m(487ft) elevation on dry rocky hillsides and ridges. It can be found in patches on chaparral slopes, forests, canyons, and along river banks. It is abundant in some annual grasslands and oak woodlands. Yerba Santa is often found in disturbed areas and early to mid successional communities. Yerba Santa is a “fire-following” species. Seeds stored in the soil for decades germinate readily during the first spring after a fire. Older plants can sprout from their underground stems, called rhizomes, following disturbances such as fire. 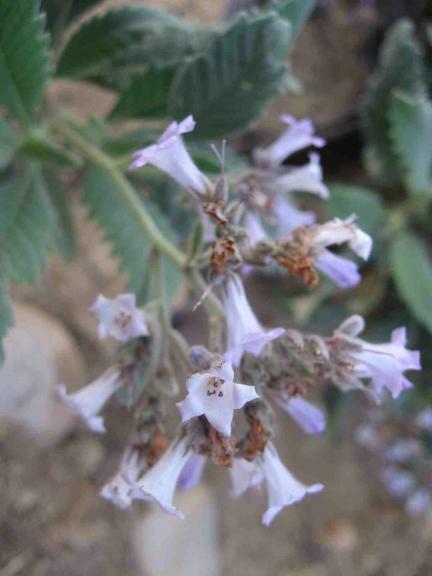 Yerba Santa can be used for rehabilitation and stabilizing disturbed areas (Howard, J.L. 1992. Eriodictyon californicum. In: U.S. Department of Agriculture, Forest Service, Rocky Mountain Research Station, Fire Sciences Laboratory 2001, May. Fire Effects Information System, 20 December 2001). The seeds germinate readily in disturbed soils. The shallow, spreading root system can help to stabilize areas subject to erosion caused by runoff. Gather seeds in September and October as the fruit capsules ripen. Yerba Santa seeds can be planted in the fall of early spring. The seeds will store indefinitely if kept in a dry, cool location. Prior to sowing, mix the seeds with several parts of moist sand. This helps to ensure even distribution. Seeds can be sown directly into a prepared bed or into flats filled with a mixture of equal amounts of soil, sand, and leafmold. Adding Charate (burned and ground plant stems) to the soil may also increase germination success. When seedlings are large enough to handle they should be transplanted into larger pots. The plants can be placed into the ground the following spring. Yerba Santa is sunloving and does not tolerate shade. Plants may be grown in any texture of soil but prefer it to be slightly acidic and moderately fertile. The shallow roots allow them to establish in thin as well as deep soils. The plants are tolerant of serpentine soils. When selecting a site keep in mind that after two years Yerba Santa can reproduce vegetablely through rhizomes. These underground stems can spread as much as 2.5m in one year under excellent conditions and may overrun other plants. This vegetative spread results in cloned patches with plants spaced from 20 to 25 cm apart. The plant should only be pruned in the spring or early summer.